Over the last two decades, there have been few, if any, academic institutions that have not built new classrooms and integrated advanced classroom technology in them. Many of these undertakings have been successful, in the sense that the faculty, students, and administration thought that the technology was useful, that it worked as expected, and, that both teaching and learning goals were met in the new facilities. Unfortunately and all too frequently, however, there have been stories of disaster as well. "We spent all this money, and nobody uses the equipment." "Nobody can figure out how to work the controls." "Somebody changed all the settings." "The technology is too complicated, and I don't have the time to figure it out." "The equipment just doesn't work." It is likely that the vast majority of advanced technology classroom projects succeed in some measure, though far too many fall short of fully meeting the expectations of those who envisioned, funded, and built them. And there are several ways in which advanced technology classrooms can disappoint users. Unfortunately, many of the seeds of future problems are inadvertently planted during the early planning stages of the classroom design process and in large measure could have been avoided. Here is a list of planning pitfalls to watch out for. 1. The tendency to integrate technology for the sake of creating a Smart classroom, rather than targeting pedagogy and meeting specific instructor teaching requirements. Too often, models of successful high tech classrooms are replicated without a complete understanding of the drivers that led to the original design in the first place. This mindset fails to recognize that technology is but a small part of overall classroom design and that subtle non tech characteristics--such as room size, shape, furniture, storage, circulation, etc.--also play a significant role in meeting user expectations. Further, there seems to be the implicit assumption that building a smart classroom can be a goal unto itself. If you build it, it will be used and add value. It will add a competitive advantage to our institution. It will be simple enough so that the faculty can figure out how to use the equipment. While this last point may be true for a limited number of adventurous teachers who are willing to experiment, the majority of users might not be willing to adapt their teaching styles as needed. For this reason, the special equipment provided in high tech classrooms may be drastically underutilized. Building advanced technology classrooms, without understanding who will use them or why often leads to disappointing results. 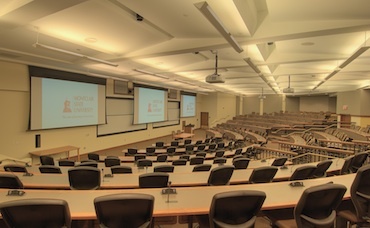 Montclair State University's Classroom of the Future. 2. Design motivated by the fear of making a mistake, by setting the goal of achieving maximum flexibility, rather than more closely targeting room design with proposed usage. User representatives providing input for new classroom projects often identify flexibility as the most important requirement. While no one would argue that a range of flexibility is a good and rational design criterion, too often the request emanates from a lack of clarity or vision about how a space will be used. Targeting flexibility may serve as a convenient way to avoid making hard choices. Unfortunately, demanding a broad range of flexibility at differing ends of the utilization spectrum can often create opposing design goals, the solutions to which foster a result that meets the criteria of the lowest common denominator and fails to satisfy any user requirements adequately. A common example are rooms with movable walls, which in theory allow for providing differing amounts of space for various population sizes. All too often, these types of rooms are not reconfigured, and the flexibility feature goes unused. Worse yet, additional dollars were spent for special construction, and acoustic isolation quality was sacrificed. Another example is designing a large flat-floor classroom to preserve the opportunity to use movable furniture, without taking into consideration problematic sightlines that a sloped or tiered floor would have avoided. The benefits of flexibility must be closely examined and its goals clearly articulated and rigorously defended. Indeed, there are times when either two different types of spaces are required to satisfy the overall range of needs or an agreement needs to be reached acknowledging that one set of goals cannot be met. It should be noted that issues of flexibility that lead to successful outcomes are not typically technology-related but revolve around room size, student population, furniture choices, circulation, room orientation, lighting, outside awareness, etc. When these criteria are not balanced correctly, especially in an expensive, high-tech classroom, the disappointment is all the greater. Three purpose-built classrooms. 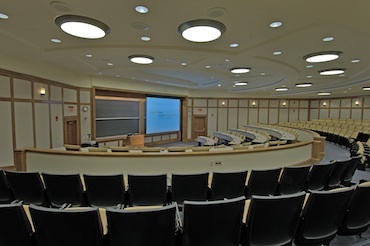 Top to bottom: University of Michigan's Ford School Auditorium; a 200-person classroom at Montclair State University; and a classroom in Hawes Hall at Harvard Business School. 3. Failure to recognize that the ways technology will be used by teachers will naturally evolve over time. Best practices suggest that, after detailed discussion takes place and after hard decisions are made about how learning should take place within a particular room, technology requirements be established. It would be a mistake, however, to assume that the initial vision of how technology should be used will remain static over time once the room has become operational. Indeed, as new capabilities--large screen displays, video origination, local and remote collaborative technologies, etc.--are made available, opportunities to use these learning tools in new ways become obvious to teachers and students. And the desire to make changes and expand capabilities will result. This natural tendency should be both anticipated and embraced. The appropriate planning response to this challenge is to envision a fully equipped and enabled space at the outset and ensure that power, conduit, pathways, and potential connectivity are provided for in the base building even if all the equipment will not be initially purchased. Keep in mind that classrooms have a useful lifespan of decades. It is almost certain that additional technology will be funded, purchased, and installed at various times in the future. It is critical that, early in the process, expectations be set in the minds of all stake holders that the use of classroom technology tools will change over time and that establishing requirements for technology is, ultimately, an ongoing process. 4. Failure to identify a suitable technology quarterback--a representative of the institution who can serve as a conduit and technology advocate among the proposed academic users; representatives of the facilities or design and construction group; and the architects, engineers, and consultant team members who are charged with designing the new facilities. The role of technology quarterback, advocate, or coordinator (or however it's termed) is a critical function, whether or not it is formalized as the responsibility of a single person. Determining user requirements for learning spaces is an iterative process, one that can make it difficult for a large group of participants to keep abreast of. It is important to identify an individual who can expedite the back and forth flow of information among parties with vastly different goals, get questions answered in a timely manner, and keep track of decisions made. Architecture and engineering work is intensively iterative as well. Moreover, different and often competing outcomes are targeted by the various design disciplines, such as aesthetics, constructability, budget, safety, etc. Each of these goals should and usually does have an advocate. It is important that the technology quarterback be assigned to provide advocacy for elements affecting classroom technology. Sometimes the technology advocate role is assigned to the wrong person, to someone who has other primary functions, with technology being a secondary consideration. Half-hearted attempts like these generally don't work or are compromised at best. 5. Failure to take support and operational issues into account during the design and installation process by not hiring the chief tech support manager and allowing him or her to participate during these final implementation phases. When dealing with managing technology-based systems, it is usually best to involve the tech manager intimately in the development of the design and implementation processes. Through his or her participation, solutions employed will more closely match how the tools will actually be used. Further, doing so creates a manager who is personally vested in the success of the undertaking. While it is tempting to put off hiring a tech manager until just before occupancy, the quality of the overall outcome can be diminished as a result. This is especially true wen the new manager either senses exclusion from participation or inherits someone else's less than perfect design. 6. Failure to train new users in the use of classroom technology. Teachers who are expected to teach in new, well equipped classrooms are almost always offered training. Those who are interested make the effort to get the training and, more importantly, put in the time with the new equipment to master its use. Other faculty with less experience or interest may get the training but do not learn it well enough to be able use it to meet their needs. This leads to frustration and underutilization of the available capabilities. Some version of this training success/failure scenario occurs in every population of users of new classroom facilities. How can outcomes be improved? 7. Failure to acknowledge and adequately respond to teacher's natural resistance to change. It is well known that the introduction of new classroom technologies is disruptive because it necessitates a fair amount of work to adapt teaching materials to be effectively conveyed using the new capabilities. Many teachers, who may be overworked to begin with, are unwilling to put in the additional effort. How can we minimize, to the greatest degree possible, the tendency toward not wanting to undertake extra work to use the technology? First, mandating a so-called "friendly" user control interface can only go so far towards making an advanced technology classroom easy to operate. It must be recognized that every user who encounters a new interface needs time to adapt to it--some far more than others. Next, consideration must be given to the importance of actively marketing the availability and advantages of using the technology. This entails a consistent and regular stream of communications to the faculty, reminding them how the technology might be useful to them. Frequent and ongoing demonstrations are also useful, especially if presented by other faculty members. Other efforts might involve targeted attempts, one tech support person to one teacher, to provide training and support. Successful outcomes require effort be expended, as much in marketing, as in tech support. Keep in mind that teachers, like everyone else, dislike fumbling in public. Do not underestimate the fear factor that might be involved in using the new teaching techniques in front of students. To address this, a number of institutions have created practice or mock classrooms, with the intent to create a "safe" environment in which teachers can experiment. Though counter-intuitive, providing this extra space can play a large role in furthering technology adoption. Another effort that can and should be made is to create a support function to aid instructors in creating multimedia materials. Often times, this takes the form of a small faculty computer lab where teachers can go to get access to workstations with special hardware and software. Providing support staff in the labs is helpful in answering questions and speeding the production process. 8. Failure to provide sufficient technical staff to adequately maintain the equipment, address technical problems quickly, and provide ongoing support for instructors who want to use the equipment. When budgeting the various costs for educational technology, it is impossible to avoid the ongoing cost of the staff needed to maintain the equipment and support users. This financial cost factor must be acknowledged and accommodated during the classroom design phase. While it may be possible to get dollars for construction, equipment, and initial installation, in these difficult economic times, it will be uncertain whether funds to maintain appropriate staff levels in classroom technology support areas will be available in the future. Be clear in the expectation that insufficient support staff will almost certainly lead to equipment failure, user problems and frustration, and decreasing utilization. If an institution can't afford ongoing support for enhanced technology classrooms, they might consider not building them. Another important issue relates to where classroom technology support falls in the organizational structure. At times, it is a function unto itself or part of a media group. In other cases, it falls within the IT or facilities function or even an administrative function reporting to a dean or vice president. While it might be tempting to make an argument that one reporting line is better than another, in truth, the best location on the organizational chart is probably wherever the support group is well managed, adequately funded, and enabled to provide excellent customer service. 9. Failure to recognize that initial equipment purchase and installation is only the beginning of the required funding stream. Ongoing maintenance and periodic equipment replacement, if not expansion, will be required over time. Equipment installed as part of any high tech classroom always has a warrantee coverage period of at least a year. Contracts are often written to cover two or even three years of coverage. However, sooner or later a maintenance contract must be purchased in order to maintain the equipment. Also, some equipment--projector bulbs, batteries, and other consumable items--need to be replaced periodically, as do wireless microphones or remote controllers that go missing or become damaged. There are times when only a portion of the full complement of equipment can be afforded initially. In these cases, it is useful to establish a multiyear equipment purchase budget at the time of systems design, in order to gain an understanding of future cash flows. Finally, key items of equipment need to be refreshed periodically. Video projectors are the prime example and should be replaced every three to five years, depending on utilization rates. To reiterate, when budgeting initial equipment and installation purchases for most classroom projects, consider the ongoing related support costs for at least a period of five years. 10. Failure to conduct post occupancy followup surveys to determine perceived problems and obtain faculty insights about where improvements should be made. After all the hard work that goes into designing and building new classrooms, it seems shortsighted not to get feedback about how well the new facilities are received by its users. In most cases, both positive and negative feedback will result. Both are vitally important elements in the "lessons learned" aspect of a project, which can be applied to subsequent new classroom building efforts. In fact, every year or two additional feedback should be gathered in order to capture the ideas of existing and new staff members on an ongoing basis. Keep in mind that every project has its shortfalls, and mistakes previously made should not be repeated. Furthermore, since the use of educational technology in the classroom is an ongoing developmental process at every institution, it is likely that valuable new insights will be uncovered as well. 11. Failure to organize and standardize classroom technology on an institution-wide basis. Too frequently, efforts to upgrade classroom technology, either by creating new facilities or renovating old ones, begin with a clean slate, forcing participants to reinvent the wheel each time. 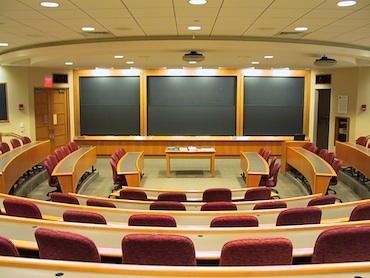 Moreover, it is not uncommon for personnel at different schools within a university, for example, to approach the development of classroom technology in isolation. Often, they don't talk to each other. As a result, opportunities for informed, cooperative planning and implementation are lost. Sadly, one group's painful mistake becomes the future shortcoming of another group's project. Just as enterprise-wide IT standards are recognized as critical to an institution's successful operation, the time has come to cast classroom technology in the same organizational framework and give it the same enterprise-wide priority.